I have some very expensive ornaments on my tree, including a whole bunch of sparkly stuff, globes, and hand blown crystal. 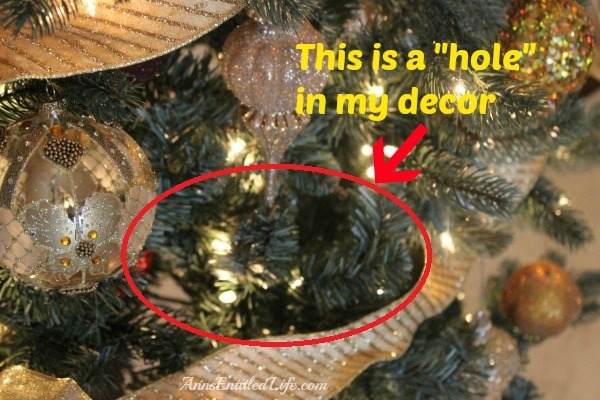 However I have noticed that a lot of ornaments, particularly crystal (my tree is gold and red predominantly with a touch of white and crystal) don’t fill the “holes” in a tree. As with my banister, I plug the holes with picks and flowers. They are a much larger scale though. I do have some that protrude, some that lay flat, some that clip on, just as with my banister. 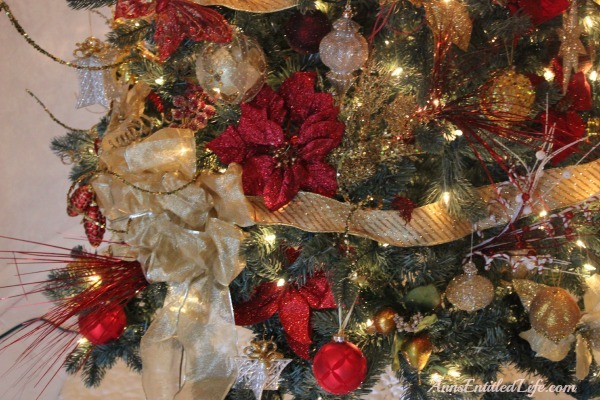 I use these interchangeably, although the tree doesn’t receive the color assortment the banister does. So, I locate a hole (that is my niece! ), and basically insert one of those 50¢ – $5 pieces of decor I buy at JoAnn’s on sale, various Christmas stores, Pier 1, etc. You name it, if a store sells glittery flowers, picks, sticks, ribbons, bows and I like them, I look and buy as the color scheme fits. Straighten, and you are done! Up to the very top! I am all about easy decorations. 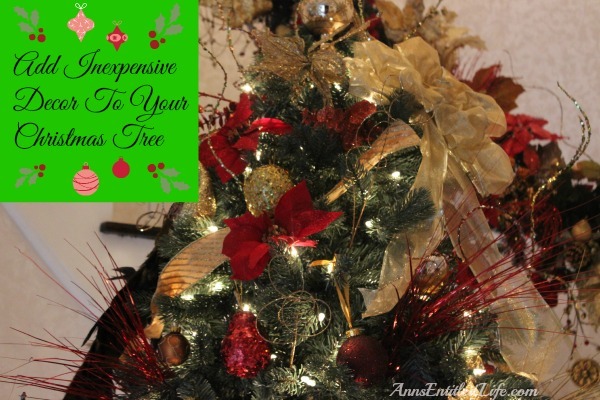 I can add or subtract my cheap Christmas Tree decorations as I want the tree to appear – full or minimalist. This year, the tree is a bit sparse because the banister is so full. I wanted to highlight the banister this year because, with our seemingly endless house renovations, the banister is scheduled for replacement in February. That means I won’t be decorating it next year, and therefore, I wanted the banister to be emphasized this year. I am not kidding when I say I change things up. 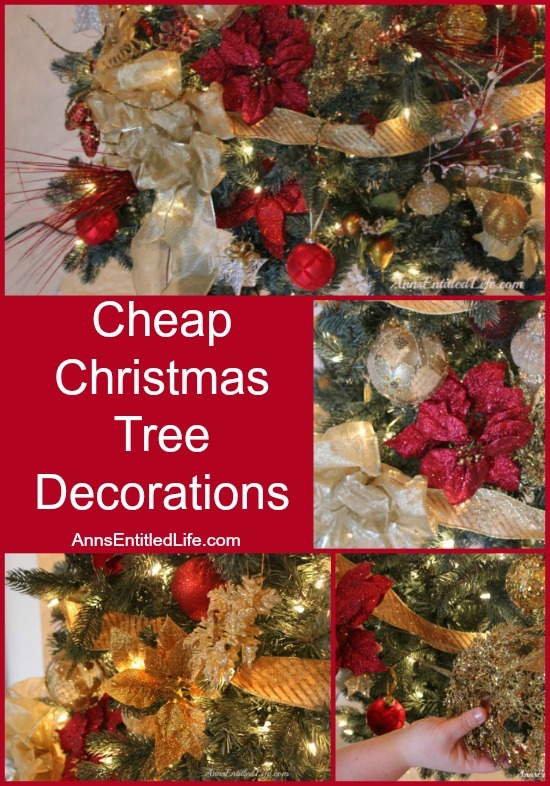 The beauty of cheap Christmas decor is you can add to it, or subtract from it, at will and not feel guilty as you would with more expensive decor. • For more holiday posts, click here. Disclosure: the links in this post may be affiliate links. LOL Stephanie. 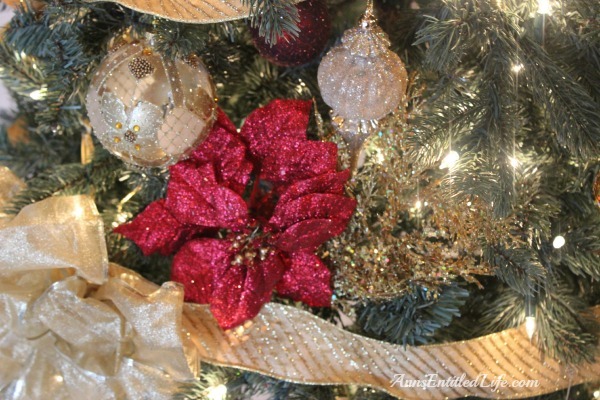 I am a less is more gal in all other decorating aspects – I just let my inner glitter child take over for the holidays. 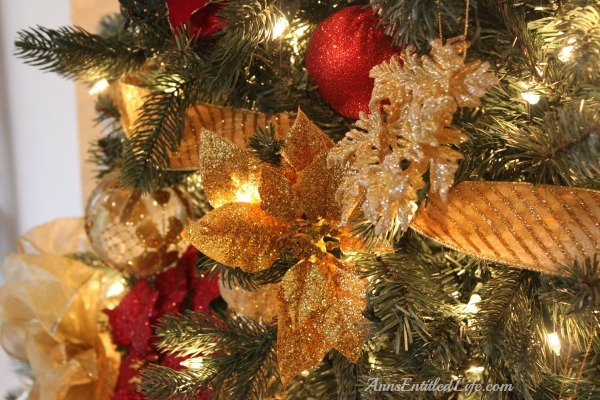 Your decorations are absolutely beautiful! Oh my goodness! My daughter is now driving me nuts because she wants a tree and she wants it to look like yours. Girlfriend better ask for a job while she is at it! Awww that is so sweet! Get the poor girl some glitter, Tamona! Apparently you are my mom’s tree decorating “twin”. 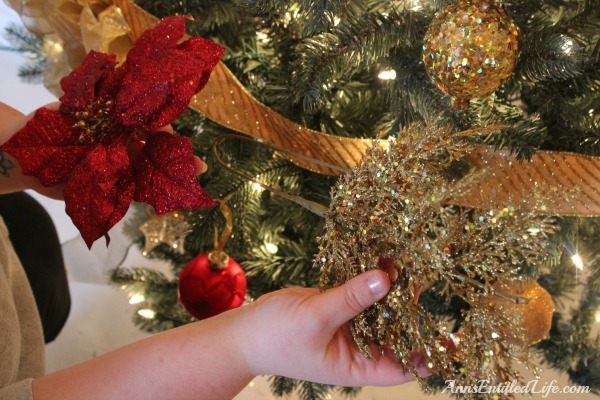 I’ve always loved the way she fills in with sparkly things and those twisty glitter sticks and poinsettias. The only difference I see it that yours is red and gold, and her’s is cream and gold. Just gorgeous, nice work! Cream and gold sounds gorgeous! I have been thinking of “adding” a third color so I have choices… red and gold, red, gold and third color, red and third color and gold and third color. I could really switch it up!